Short rows make seaming a garment a breeze and can be used to shape shoulders, custom fit the bust area, and impart design elements such as staggered stripes. Many knitters shy away from short row knitting—it isn’t that they have trouble working just some of the stitches on the needle, it’s the fact that doing so always seems to produce a hole in the knitting. Although in some cases the holes can be design elements, in most cases, they distract from the purpose of the short rows—invisibly adding length to a particular area of a piece. 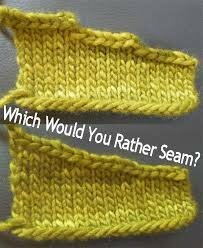 However, there are several ways to eliminate (or hide) the holes so that the short rows become nearly invisible, be it wrap and turn, Japanese or German methods it is time to no longer be daunted by this term/ technique!! Bring scrap worsted/ DK yarn and appropriate needles.